An epic clash between strong Canadian teams and seasoned programs from the USA is going down in Ontario this weekend. With Worlds and Summit bids on the line, teams are bringing their A game to the mat to prove they are the boss on any side of the border. At Feel The Power East 2018, Elite Heat Allstars were the big winners, taking home a whopping 6 Summit bids, and the Program Award. This season, they have returned, hoping to turn the temperature up even more. 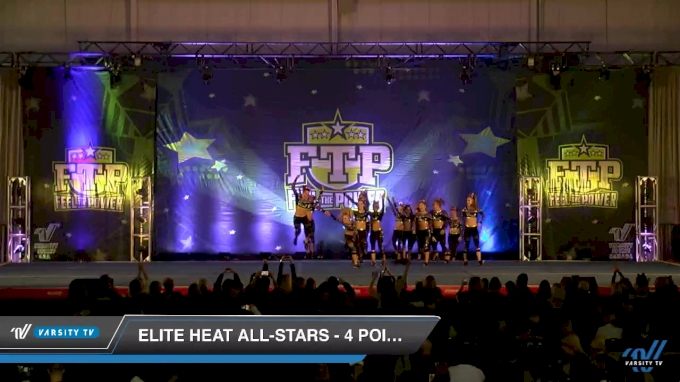 [Watch} Elite Heat - Fout Point Fierce! The team brought the house down with an incredible Day 1 performance. It came with a slew of energy, incredibly paced stunts and jaw-dropping difficulty. From start to finish, they had the crowd behind them, and they showed off why they’ve earned their unique team name. Looking ahead to Day 2, Four Point Fierce will be competing to be the hottest team in an already blazin’ division. Surely, the venue is going to need some fans to cool down once these ladies hit the mat once more for Day 2. Gym owner, Laura Kausner Voigt, believes in setting up her athletes for success as well rounded humans, in addition to being stellar athletically. Creating a gym atmosphere where the athletes can grow as individuals, as well as cheerleaders, has proven to be key. There is a special level of confidence that Elite Heat athletes portray when they’re on the mat. It’s the kind of confidence that can only come from hard work, and genuine, caring, coaching. Competing at an international event has provided the Elite Heat athletes with an experience that most others don’t typically get to have. Kausner Voigt noted that her athletes “get the opportunity to compete against some great Canadian teams, and build a relationship with programs from across the border”. That, coupled with feeling like that the producers of Feel The Power genuinely care about creating bonds with programs, helped make the decision to have the event on their calendar once again this season. After a strong Day 1 showing and Day 2 on the horizon, the program is in a position to be one of the top overall performers once again. There is no doubt that when Feel The Power East is complete, Ontario will be hotter than ever from having the Elite Heat kids in town.